My rating: 9/10, Excellent watch. Titanium build, Eco-Drive technology. 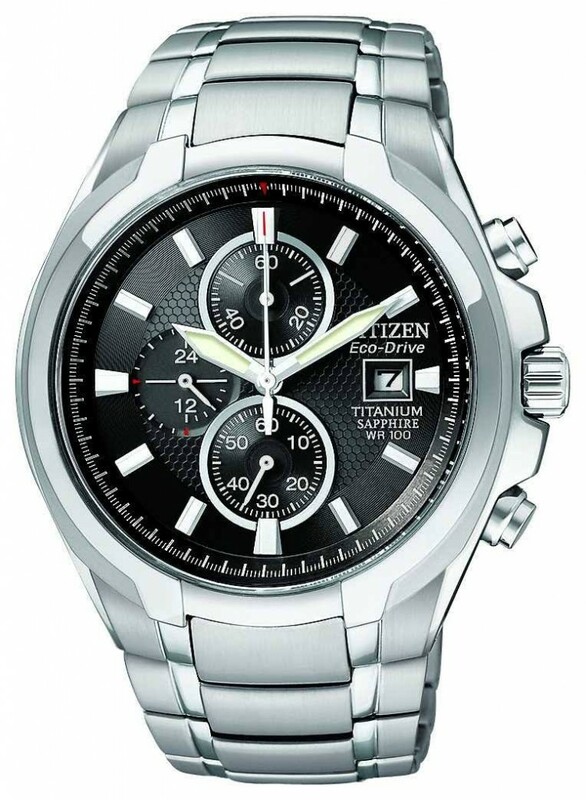 Citizen CA0260-52E watch is built with quality in mind using some of the best materials available. The casing is made of titanium which is stronger and lighter than traditional stainless steel, it’s also popular among those with metal allergies who are after a hypoallergenic alternative metal watch. They’ve used sapphire glass which is extremely durable with a Mohs hardness rating of 9 making it very scratch resistant. One of the best features of this Citizen watch is the use of it’s Eco-Drive technology, powering itself from light means you’ll never have to change the battery, something I’m a big fan of. You may also like my 100 most popular watches under £500. Band Titanium strap, standard length, 26mm width, fold over style clasp. Case Titanium, sizing diameter: 43 mm and thickness: 12 mm. Dial Smart textured dial design. Highly scratch resistant sapphire glass. Simple date display. Movement Accurate solar powered quartz movement with chronograph function. Analogue display. Water Resistant A water resistance of up to 100m / 10 bar. Solar powered via Eco-Drive technology which uses natural and artificial light to power itself. Titanium build makes this watch stronger and lighter than a stainless steel watch. Citizen CA0260-52E watch is the ideal choice for those looking for something with high build specifications and quality design. I’m a big fan of Citizen’s Eco-Drive watches as I love the technology and the ability to charge your watch up using light. The titanium build is a big benefit in my opinion as it makes this watch accessible to more people who have allergies, and it’s a better material to use than stainless steel. Overall an excellent quality watch for an affordable price. Hope you enjoyed this Citizen CA0260-52E review. Find more watch reviews below.